Bad lighting can make any great camera look average. But, great lighting can make any average camera look much better. The way a camera lens perceives light when compared to our eyes is entirely different. The camera needs much more light to be able to capture what we see. Knowing the basics of video lighting and applying it to your videos is crucial because it’s all about the viewer’s experience. Why does video lighting matter? With any significant piece of content, the goal is to get a message across, whether you’re teaching something, selling something or sharing your thoughts. To do so, the way you put out your content should be seamless. In other words, if your structure is on point, your audience shouldn’t even think about it and should focus only on the message. But, if your structure is flawed, your audience might have a hard time concentrating on what your message actually is. For instance, if you have great content but your footage is too dark and blurry, it will distract viewers from what you’re saying. Plus, most viewers won’t stick around for too long. Like any other art form, there’s no such thing as perfect lighting and determining if the lighting is good or bad can be highly subjective. Since we are talking about the basics of video lighting, we’ll go through some of the key factors and what’s commonly referred to as good lighting. There are three key factors to keep in mind when it comes to lighting: the exposure, the direction, and the quality. When you take each of these factors into consideration, you’ll be able to assess the lighting of your videos and improve upon it. The exposure is basically how much light is in your shot. When a video is described as underexposed, it means there wasn’t enough light, so it’s dark and lost shadow details. The dark areas of the footage are “muddy” and cannot be distinguished from the black areas. Opposed to underexposed footage, you can also have overexposed footage. Instead of not having enough light, you can also have too much light in your shot. An overexposed video is too bright and loses the details in brighter areas of the footage. To achieve the right exposure, you should always analyze the darker and brighter areas of your video. Look for the black areas and the shadows, can you distinguish them? Do you get enough details in the shadowed areas? Then, look for the white areas and brighter spots, are their clear? Is there enough detail? The exposure can also be adjusted in post-production if you’re creating videos on demand. But, if you’re doing a live video, you’ll need to figure it out before you go live. You can always do some dry-runs before, check the exposure and use a software to help you adjust. The direction the light comes into your shot is essential to create the right atmosphere for your video. Characters in horror movies would be a lot less scary if their faces were bright and lights were coming in from multiple directions. Instead, they usually place one light above or below, which creates intensity and harsh shadows. Unless you’re shooting a thriller, consider placing your light sources slightly above your subject, without creating too many shadows. A conventional setup for online videos is the three-point lighting. It consists in having one key light diagonally across the subject, which is the strongest, a fill light opposed to the key, less intense, just to minimize the shadows on the other side and a backlight. The backlight, also known as hair light, which separates the subject from the background. Another factor of the basics of video lighting is the quality. In this case, it refers to two main aspects of the light, soft or hard. Unless it’s your artistic choice, ideally the light on your subject should be soft. In other words, a soft light creates a smooth gradient transition between the bright and dark areas, whereas the hard light creates a harsh shift. To understand a bit more about lighting, think about the natural light. If you go out at noon on a very sunny day and take a picture, you would have an example of hard light and hard shadows on your subject. If it’s bright but cloudy, the clouds will act as a diffuser, and you’ll get soft lights and shadows. To make sure your lighting is adding to the right quality to your live stream, observe the shadows in your shot. Ideally, you wouldn’t have many shadows, and they should look smooth. 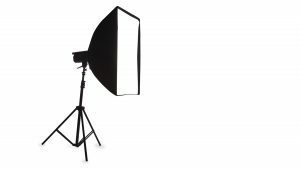 For around $100, you can get two continuous lighting kits, with softboxes which act as a diffuser and gives you soft lights and shadows. With this kit, you’ll get a distance with soft lights on each side of the subject, to minimize the shadows. 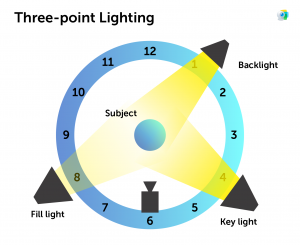 If you want to create that three-point lighting we mentioned above, you’ll also need a backlight. Because it will be in the back, you don’t have to worry about it creating harsh shadows, and you won’t need a diffuser. It will cost an extra $30, and it helps separate the subject from the background, creating some depth in your shot. When planning your video shoot or live streaming session, have enough lights, place them correctly and make them soft. The three-point lighting is an excellent setup for videos on demand or live streams because it gives your video a professional look and it’s affordable. Once you create your lighting setup, make sure you record it once and analyze the footage to see if your lighting is on point. Now that you’ve got the basics of video lighting let us know how your videos turn out!